Our 3,800 sq. ft facility is located on 2.47 acres in Willis, Texas. This convenient location near the oil capital of the world (Houston, Texas) allows quick interface with our customers and suppliers. The facility is perfectly adapted to handle highly-specialized completion tool design, testing and assembly. OES currently assists with the industries testing needs by operating two seperate high pressure / high temperature test cells on location. A remote operated steel shrouded test cell and a 30' below the ground test cell enables OES to schedule and perform tests in a timely fashion. The air conditioned assembly area allows precision assembly and breakdown of tools in a controlled environment. The large vise can make-and-break tools up to 12" diameter. The overhead crane is used inside the assembly area to safely handle and move large assemblies. Shown right is the air conditioned test control room for Test Cell #1. A hydraulic control panel and manifold allow simulation of well pressures, tension, or compression at the downhole tool being tested. 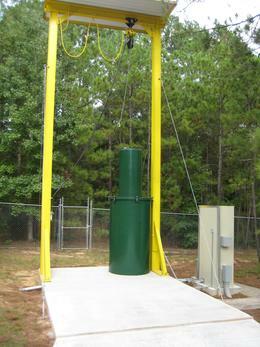 A computerized data acquisition system records selected real-time test data including pressures and temperature. Test reports can be made available on request. OES fork truck is used to load and unload equipment that is delivered or shipped to the facility. Using the fork truck properly ensures that handling the equipment will be done in a safe and reliable manner, safe for the customers equipment and safe for any personnel in the proximity. The fork truck is also used in some applications where assemblies or equipment need to be relocated or moved to different testing areas. The fork truck can also serve as a crane or hoist outside the test cell areas or assembly area, where there are no over head cranes to lift and pick up materials with.